“A caution with 10 to go would have made one hell of a race,” said Beers. A seventh place finish was nothing to be ashamed of, but it wasn’t what Beers had hoped for out of the race either. On the other hand, Jerry Marquis did stay out. It worked out perfectly as he finished fourth. 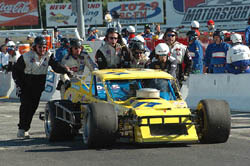 Donny Lia finished second and was the only driver in the top six who pitted for tires during the running of the Fall Final at Stafford Motor Speedway. Eric Beers was one of the majority of drivers who pitted at the one-third mark of the race and had no idea that the rest of the event, 95 laps, would go green. Beers made his way up to seventh at the finish, but like everyone except for maybe Lia, just didn’t seem to show the advantage that new rubber should have given him. However, Beers pointed out a very logical reason for this. “We knew in practice that once you first put on tires, you would slow up a little bit,” said Beers. “But when you heat cycled once, they would go faster. But we never got that heat cycle. We never got a caution to cool them off. We went green from our pit stop until then end. You’ve got to be under caution for a few laps to get them to cool way down. A late race yellow could have really changed the complexion of the race, especially considering the fact the most of the drivers who had not pitted for tires were slipping and sliding around at the end of the race. Marquis admits that he wasn’t really sure that the pit strategy was going to work. The disadvantage of driving to the finish on used rubber was that Marquis had a challenge in the closing laps just getting his car around the track. 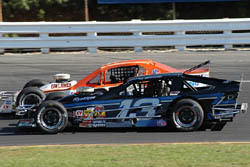 Ted Christopher finished fifth in the Fall Final and held on to his point lead over Tony Hirschman with two races to go. However, he wasn’t very impressed with the way that the race unfolded. Christopher was asked whether or regretted not pitting when most of the field did around lap 50. He said that staying out was a no brainier at the time, but who would have expected there not to be any more cautions? through the infield grass and motored on. Unfortunately, the same could not be for Mike Stefanik, Kevin Goodale, Steve Whitt or Eddie Flemke. They were all involved in the aftermath of Ruocco’s spin as they tried to avoid it and stacked up into each other instead. Goodale got the worst of the incident. His #58 car went completely airborne and suffered heavy front and rear damage. Fortunately, the Long Islander driver was not injured. Goodale looked over the remains of his ride in the pit area after the race and the early assessment was that it was going to need a lot of TLC to race again. That won’t keep Goodale from racing in the last two events at Thompson to finish out the season. He’ll just run his other car for those races. Goodale wasn't the only driver that had their day set back by the big one, we'll see how it caused Eddie Flemke to tumble out of the top 10 in the point standings later on. Well, Pasteryak wouldn’t have been a sitting duck. He would have pitted no matter what anyone else did. Still, Pasteryak found something enjoyable in the long green run. So overall, the day was enjoyable. When Donny Lia finished second in Sunday’s Fall Final at Stafford Motor Speedway with only three wheels left on his racecar, it was unusual to say the least. After a string of race plagued with bad luck, incidents with another driver and other circumstances which have kept the #18 team from getting the finishes that they are capable of, Lia is thrilled with this weekend’s end result and thankful to his team for it. Steve Park might actually be from Long Island, but Stafford Motor Speedway is a little piece of real estate in Connecticut that he can also call home. 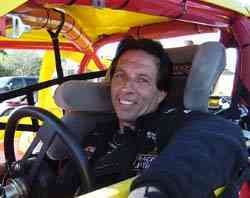 He raced at the track countless time early in his career and was there to cheer his father on even before that. 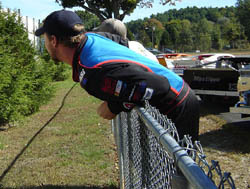 At the Fall Final, Park was entered in a team car to Ted Christopher that was fielded by Mystique Motorsports. Park definitely enjoyed coming home. 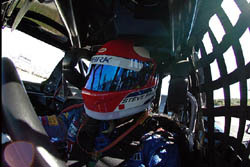 Park dropped out of the race with suspension problems and was credited with the 28th-finishing position. The crazy finish capped off a roller coaster weekend for the team. Lia won the pole for the race, but had to start in the rear of the field after he missed the driver’s meeting on Sunday morning. Lia worked his way up through the field twice actually. He made steady progress in the early stages of the race before pitting under caution at the one-third mark of the event. Lia’s team had a great pit stop and the #18 was the first car that exited the pits. Little did Lia or his team know at the time, but the rest of the race went green and Lia had to chase his way to the front without the benefit of any caution periods or pit stops by the leaders. Lia made it up to second place before time ran out. Kevin Goodale hit hard when the Fall Final saw their version of the Big One on lap eight. Eddie Flemke didn’t hit very hard at all in the incident, but it was still enough to ruin his day. Flemke had to pit for repairs and went several laps down. 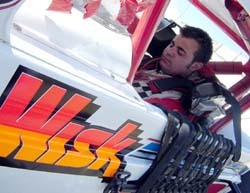 Flemke was involved in the wreck when he tried to avoid running into the back of a fellow competitor. Flemke’s finish of 24th ended a streak of good finishes and dropped him out of the top 10 in points. He now needs to work his way back up from the 12th position in the standings. That bad song parody best describes the day of Doug Coby. The driveshaft on his #77 proved troublesome at Stafford and that cost him 93 laps while his team made repairs. 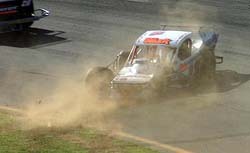 Lia was running in the second place entering turn three of the final lap when the spindle on his #18 sheared away. Lia kept his foot on the gas and crossed the finish line in a shower of sparks on three wheels. Unable to control the car completely, Lia spun after crossing the finish line but was still able to take the runner-up position. The wheel and hub assembly cleared the Stafford catch fence after the incident and landed on a vehicle in the parking lot. It also hit Lia’s racecar before going airborne. 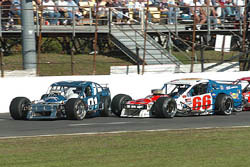 The NASCAR Whelen Modified Tour wasn’t the only show in town for the Fall Final. 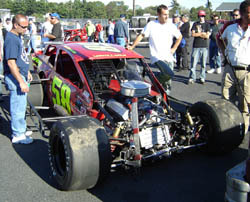 The track’s SK Modified division had a 50-lap feature immediately before the Tour race and there was a lot at stake. Lloyd Agor entered the race just two points ahead of Todd Owen in the battle for the championship and Ted Christopher also had an outside shot at the title as well. Agor finished the feature in the sixth position, but that was sufficient considering that none of his competition had good days at all. 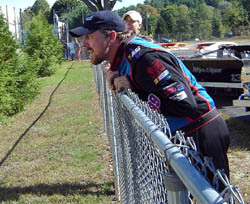 Owen had transmission problems drop him from the race early and Christopher was parked by race officials after an incident with Willie Hardie. Finishing up front was Tour driver Jimmy Blewett, who put his T&S Haulers #12 into victory lane. Kenny Horton crossed the line in second place, but was disqualified when his #19 was light going over the scales. 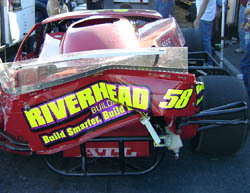 The offical top five finishers were Blewett, Jeff Baral, Keith Rocco, Hardie and Tom Rogers, Jr. 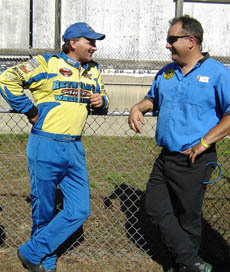 Doing double duty in the SK and Tour races were Blewett, Christopher, Frank Ruocco, Horton, Zach Sylvester and Jeff Malave.